Nicolas Takeyoshi Kiyohara, son of Dr. Alan and Lisa Kiyohara, graduated from Valencia High School in Placentia in the technology program called Val-Tech. He played four years on the Valencia Basketball team and three years for the golf team. Nicolas began his scouting career with Pack 578 as a Tiger Cub and received his Arrow of Light as he crossed over to Boy Scout Troop 578. He is an active member in the troop, serving as a patrol leader, instructor, assistant senior patrol leader, senior patrol leader and, currently, junior assistant scoutmaster. His favorite scouting memories thus far include Japan Jamboree in 2013, canoeing 90+ miles in Canada in 2015, hiking up to the top of Mt Whitney in 2016, hiking two weeks at Philmont Scout Ranch in New Mexico in 2017, river rafting, and rock climbing. During his time in scouting, Nicolas has earned the Hanano Award, Leduc High Adventure Award, Seven League Boot Award, World Conservation Award, Four Star Religious Emblem for Protestant and Independent Churches, and William T. Hornaday Award. He has also earned two Silver Palms and one Gold Palm as a result of the 62 merit badges he has attained. Nicolas’ Eagle project consisted of designing and building four Swedish Goshawk traps for the Los Alamitos Joint Forces Training Bases’ BASH (Bird Aircraft Strike Hazard) Prevention Program. The purpose of his project was to capture and relocate birds in hopes that they would not be injured or killed in an aircraft’s engine or propeller. He worked under the guidance of his Eagle project advisor, Jonathan Fukumoto, and technical advisor, Richard Gould. In the fall, he will be attending the University of Puget Sound in Tacoma, Wash., where he will be working towards a degree in kinesiology and later, plans to attend graduate school studying in the field of physical therapy. Michael Hajime Nishimoto, son of John and Janis Nishimoto, is a senior at Beckman High School in Irvine. Throughout his high school experience, he was involved in the Performing Arts and Olympic Weightlifting programs. From an early age, Michael was involved with many OCBC-affiliated activities. In addition to Boy Scouts, he was actively involved with Dharma School, Japanese School and Jr. YBA. The church has provided him with some of his greatest experiences and lifelong friendships, ones that he will cherish forever. In the troop, Michael has held many varying positions, from all the patrol leadership positions, patrol leader, patrol instructor, and eventually to senior patrol leader. All of his activities in the troop were amazing learning experiences that helped contribute to his growth over time. Michael has participated in many troop outdoor adventure programs, partaking in the treks to Mt. Whitney, Northern Tier, and Philmont, New Mexico. He will also be going with the troop to Japan during the summer for the World Jamboree. His Eagle project was named the “Family Preparedness Event” as its intention was to aid families in need with tools that would prepare them for life. The event provided children with free eye exams and glasses if necessary, and their parents received high blood pressure and diabetes screenings. At the end of each exam, the family received a first aid kit constructed in front of them, so that they will be prepared for both school and any emergencies that arise. Scouting has instilled a fundamental passion for helping others, and while only entering his senior year in the fall, Michael would like to further his education to pursue a career in medicine so that he can take his Boy Scout experiences of helping others to the real world. Trenton Kaito Ching, son of Matthew and Emilyn Ching, is a graduate of Fountain Valley High School, where he was a member of the Wounded Warriors and Medical Society Club. He was also captain of the wrestling team and the 160lb Southern Section CIF Champion in 2018. He was first introduced into scouting as a Cub Scout, and joined Pack 181 as a Webelo. When Trenton moved to California from Oahu, he crossed into Boy Scout Troop 578. During the eight years he spent in the troop, he has served as historian, scribe, patrol leader, instructor, and many other leadership positions.His favorite memories from Troop 578 include hiking up into the Sierra mountains, the annuel shotgun shooting event, and the numerous campouts with the troop. Trenton achieved the rank of Eagle Scout on Nov. 15, 2017. For his Eagle Scout project, he designed and constructed two portable storage cabinets for the University Community Park. With the help of his project advisor, Michael Oune, a previous scoutmaster of Troop 578, he successfully constructed the cabinets on Aug. 25, 2017. These cabinets were put to good use in providing participants in the University Community Park’s children’s program with a place to store their backpacks and belongings. Trenton will be enlisting in the U.S. Air Force, striving to get to medical school and become a dermatologist. 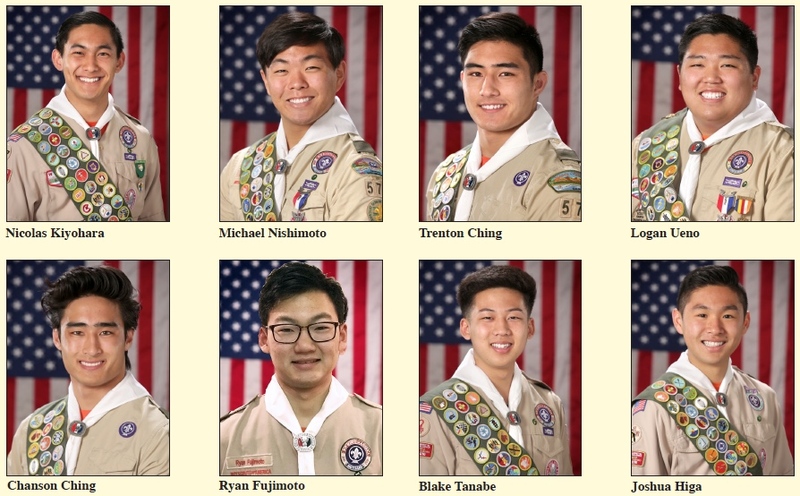 High Adventure Scout Logan Tatsuya Ueno reaches the highest pinnacle in his scouting career: Eagle Scout. Son of Rodney and Denise Ueno, he is a senior at Sunny Hills High School in Fullerton and has taken multiple Advanced Placement courses. He plans to major in political science, attain a Juris Doctorate and hopefully run for a political office in the future. Logan has eight years of Dharma School (Sunday School) perfect attendance. He will be continuing as an Orange County Buddhist Church teacher’s assistant for the Dharma School high school class. He is a member of Jr. Youth Buddhist Association and was recently elected Jr. Youth Buddhist League religious chair for the Southern District, which represents all of Southern California and Arizona. Logan has been in scouting since Tiger Cubs in OCBC’s Cub Scout Pack 578 and eventually crossed over into Troop 578’s Boy Scout Troop. He has served in a multitude of leadership positions, including junior assistant scoutmaster. His greatest memories include going on his very first backpacking trip and getting lost. He realized sometimes you have to get lost in order to find yourself. Logan’s scouting-related adventures include Belize, Mt. Whitney, Philmont Scout Ranch and the 2018 Japan National Jamboree. He has achieved all the requirements for the Leduc Award and the Hanano Award with 300 backpacking miles and 120 nights of camping. Logan is also a recipient of the Metta and Sangha Award, a religious recognition. He is also an active brotherhood member of Order of the Arrow and served as the 2016 treasurer for the Santee Chapter, which oversees the Orange Frontier District. Logan’s Eagle project, “Home Is Where the Heart Is,” benefited 250 people with care packages that also contained a handmade blanket. The benefactor was Mercy House in Santa Ana. Upon completion of his project, he realized there was a dual purpose of this final task. The first is to offer a project to improve his community; the second is to utilize the organizational, leadership and communication skills he has learned in scouting. The Eagle project isn’t really what you do, but how you do it. His project advisor was Dr. John Nishimoto, Troop 578’s current scoutmaster and his mentor since the first day of Cub Scouts. Chanson Rikuto Ching, son of Matthew and Emilyn Ching, will be graduating in June from Fountain Valley High School, where he was on the wrestling team for four years and a two-year varsity member. His scouting career started when he joined pack 181 in Hawaii then crossed over to Troop 578. After nearly nine years in Troop 578, he achieved the rank of Eagle in December of 2017. His best memories of scouting include all the campouts, such as shotgun shooting and the Sierra hike. He also enjoyed being able to help younger scouts in their journey through scouting. Chanson served in many positions throughout his years in the troop, including patrol leader, scribe, troop quartermaster, historian, and troop instructor. Chanson’s Eagle project consisted of planning and constructing four wooden benches for Fountain Valley High School. His project advisor was Sean Suzuki, currently an assistant scoutmaster in Troop 578. In the fall, he plans to join the Air Force, attend college and pursue a career in dermatology. Ryan Akio Fujimoto, son of John and Tracy Fujimoto, is a graduate of Palos Verdes High School. He was a four-year member of the cross country team and a three-year member of the track and field team. He has been attending Dharma Sunday School since he was in preschool. He is a member of Jr. YBA. He played in SEYO basketball from second through 10th grade and has volunteered as a coach for the OCBC Chibiko program in his freshman year. Ryan has been in scouting since Tiger Cubs in OCBC’s Cub Scout Pack and eventually bridged into Troop 578’s Boy Scout Troop. He has served in several leadership positions in the troop, such as quartermaster, scribe, patrol leader, historian and instructor. The annual ocean boat fishing trip is one of his favorite memories as a Boy Scout. His Eagle project consisted of him building four zabuton rolling storage units for OCBC. They were first used at the Hondo rededication service in October 2017. In the fall, is attending the University of Hawaii at Manoa, where he will be working towards obtaining a degree in mechanical engineering. Blake Kiyoshi Tanabe, son of Dave and Vickie Tanabe, is a graduate of John F. Kennedy High School. He was a freshman player on the Fighting Irish basketball team and a four-year member on the volleyball team. As an Orange Coast Optimist Club member, Blake played several years of baseball and volleyball, and every year of basketball since kindergarten. As an OCO Jr. Optimist and OCO Octagon, he participated in several community service events such as making Thanksgiving baskets for families in need, preparing and serving hot meals, hosting Easter parties at Tanaka Farms for foster children, and gathering and distributing gifts during the Hylond Home Christmas Party. His scouting career began in Cub Scouts, where he joined OCBC Pack 578 as a Wolf, eventually crossing over to Boy Scout Troop 578 and picking up his Arrow of Light award along the way. As an active member, Blake served as patrol quartermaster, assistant patrol leader, patrol leader, patrol instructor, troop instructor, and troop quartermaster. His favorite memories include participating in the 2013 Japan Jamboree and several High Adventure outings, including Northern Tier canoeing in Canada, long-term backpacking trips to Mt. Langley and cross country to Mt. Whitney as well as the Philmont Scout Ranch. Earning the Hanano Memorial Award, Leduc High Adventure Award, and the P.R.A.Y. Award through Wintersburg Presbyterian Church were also highlights. Blake’s Eagle Scout project consisted of completely removing and replacing 440 feet of post and rail wooden fencing bordering the northwest portion of the Bolsa Chica Ecological Reserve. He raised enough funds to pay for the extensive project materials. Aided by Project Advisor Michael Oune, Life-to-Eagle Coordinator Mark Arima, and Project Technical Advisor Richard Rappe, he successfully guided the completion of the project in two days. Blake would like to thank the leaders, scouts, and parents of OCBC Troop 578 for their continued support throughout his scouting career. His plans include enrolling at Cypress Junior College and eventually transferring to the Fashion Institute of Design and Merchandising, Cal Poly Pomona, or Laguna College of Arts to pursue his interests of fashion design and marketing. Joshua Matsuo Higa, son of Ellen and the late Keith Higa, is currently a senior at Glen A. Wilson High School. He plans to major in biology but is still unsure about which school to attend. He is a member of the SOC Jr. Optimist group and is hoping to run for senior president in the future. Joshua has been in the scouting program ever since Tiger Scouts, but after Cub Scouts he found his way into OCBC’s Troop 578. Within his time in the troop, he has held various positions such as historian, scribe, quartermaster, Trail to First Class lead, patrol leader and patrol instructor. His Eagle project was the construction of four 16” by 32” cubbies for Kristina Sasaki’s 3rd grade class. The cubbies were made from melamine MDF wood and featured lockable casters and removable shelves. His project advisor was Sean Suzuki, a Troop 578 assistant scoutmaster and well-known advisor for many past Eagle projects. Joshua is very grateful for all the time and help Suzuki offered him. Some of his favorite memories happened in events like shotgun shooting, ocean fishing, beach camp and Philmont. Scouting has been an experience of a lifetime and Josh hopes to make the most of his time before he ages out.